The latest Apple iPhone 6 leak involves a video showing a couple of mockups, that allegedly show off the next iteration of Apple's iconic smartphone. We see two models, one in Space Gray and one in Gold. And once again, we see all of the design cues that previous leaks have shown us. The rounded corners, the thin body, the power button moved to the opposite side, the larger screen, and the back that reminds you of the HTC One (M8). Yes, it is all here, even the protruding rear camera lens that we spotted on an earlier leak. And we would be amiss if we didn't point out that these dummy mockups were apparently obtained from Sonny Dickson. He's the Australian youth who made Tim Cook and crew shake their fists at the mere mention of his name last year, when he obtained all of those Apple iPhone 5c casings and leaked them weeks ahead of the unveiling. While we still remind you to take these leaks with a grain of salt, and use your cynical eye when viewing them, there does come a point when the old saw "where there is smoke there is fire," needs to apply. We might not be there yet, but we are getting close. ^ Blank comments are cool. blank comment ? teach me master..
Next big thing?? This news is misleading, title should be " Mockup video show us what the next Small thing is"
same here though I like the iOS but my main problem is its restrictions. I am used to customizations on my android none of which can happen on iOS(without jailbreak). Well I can't help but be disgusted with how Apple has pretty much just stolen everything from the HTCs M7 and M8. 4.7" screen of the M7, design of the M8, Beats from the M7..... C'mon Apple I know your visionary Steve Jobs is dead but at least try to be original...... It's so pathetic. I'm still wondering how Apple is going to make the 'back' button more accessible on its with a large screen device because the back button is almost always on the top left, which is impossible one handed. Good luck with that. Not only that, but the back button in safari are at the bottom. I'm not sure what gigaraga is talking about. Maybe they are talking about certain apps. Same thought here. It may annoy us after, say, a couple of weeks of usage. Lol that camera lens on the gold one is disgusting. yes there is no WOW factor about it bcuz it looks like ipod touch and previous iphone. I liked the design of iphone 4 cuz it was unique. this concept looks good btw. except that lines at back side.. They borrow something from x, something from y and something from own backyard and at the end voilà the iphone 6. Bezels gone wild. Why haven't they left the iPhone 4 design modeling? Good and stylish design from Apple, as usual, but 138mm for a 4.7" screen phone... that's not a good screen to bezel ratio. An old Optimus G E975 is 132mm with 4.7"screen. Anyway, the bigger screen is a long, long overdue change for Apple . Cool, this is only like what? 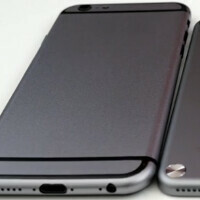 The 13th article about what the iPhone 6 may look like? ALmost as bad as the gazillion articles on the different cases for the SGS5 (except, at least, you can buy those). Not so iconic eh PA? 3D printed schematics that were made available to the public last week... I still think this design that is leaking everywhere is the next iPod Touch, and that the iPhone 6 design will look similar to the 5/5s but larger, slightly thinner, and hopefully minimal side bezels.